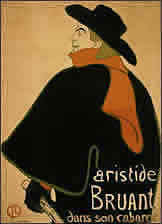 This is Lautrec's third rare poster which he designed specifically for the French singer & songwriter Aristide Bruant (1851-1925) (illustrated right) who typified and dominated the Parissienne, Montmartre café - concert scene. Among the most insulting of performers, Bruant delighted his audiences with his lewd and domineering treatment of them. Commissioned by the singer himself, this poster was issued in four editions announcing performances at the Théâtre Royal and the Alcazar Lyrique and the singers homecoming in Montmartre. Perhaps this is the most memorable of all of the Bruant posters by Lautrec, standing as the perfect reminder of the café era, it was designed to be overprinted with different texts for different occasions. The poster shows the figure from behind, looking over his left shoulder, with the artist capturing perfectly the personality of Bruant. 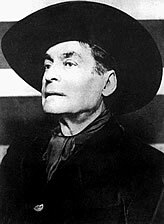 The trademark black cape, scarlet scarf and the black hat which had become symbolic of Bruant himself. Son and heir of Comte Alphonse - Charles de Toulouse, Henri de Toulouse-Lautrec was born on November the 24, 1864, in the South of France. 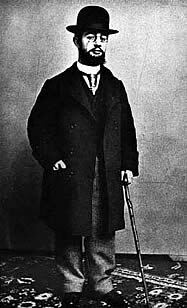 Lautrec was the last in the line of an aristocratic family that dated back over a thousand years. Today the Lautrec family estate houses the Musée Toulouse-Lautrec. As a child, Henri was weak and sickly, but by the time he was ten years old he had begun to draw and paint with an astonishing ability. At the age of twelve Toulouse-Lautrec broke his left leg and at fourteen his right leg. The bones did not heal properly and his legs ceased to grow. He reached maturity with a body trunk of normal size but with abnormally short legs. He was only 4 1/2 feet tall. Deprived of the physical life that a normal body would have permitted, Toulouse-Lautrec lived completely for his art. He lived in the Montmartre district of Paris, the center of the cabaret entertainment and bohemian life that he loved to depict in his work. Dance halls and nightclubs, racetracks, prostitutes - all these were memorialized on canvas or made into lithographs. Toulouse-Lautrec was very much an active part of this community. He would sit at a crowded nightclub table, laughing and drinking, meanwhile making swift sketches. Then in his studio he would expand the sketches into brightly colored paintings. In order to join in the Montmartre life - as well as to fortify himself against the crowd's ridicule of his appearance - Toulouse-Lautrec began to drink heavily. By the 1890s the drinking was affecting his health. He was confined first to a sanatorium and then to his mother's care at home, but he could not stay away from alcohol. Toulouse-Lautrec died on September 9th, 1901, at the family chateau of Malrome.